If you've left your house or simply trolled the pages of sites like Pinterest or Tastespotting recently, you've probably observed the same thing I have. The world is covered in pumpkin-flavored everything right now! From a recipe recreating the popular Pumpkin-Spice Latte, (PSL) to pumpkin bread, cookies, soup and even gnocchi, pumpkin-y goodness boldly proclaims the season change. My youngest daughter called on her way home from an evening class last week and said, "You know what I'm in the mood for? Your pumpkin apple muffins. They make me feel like Autumn." Well, I can't argue with that! So, I'm whipping up a batch for my girlie, the lone chickadee left in our nest. The house smells amazing... I'm tempted to build a fire and don a sweater.... but maybe not. Even though the calendar reads Fall, here in Coastal Georgia we're hanging onto the last remnants of summer heat. These muffins are simple to throw together. Cutting up the apples takes longer than any other part of the prep. And even that isn't too awful long. The original recipe contained even more sugar and quite a bit of oil. Since I'm trying to win the battle over my own personal muffin-top, I lightened them up by substituting the same quantity of applesauce for vegetable oil. On the Weight Watchers' plan each muffin is 3 points. If you double the recipe, you will use one entire can of pumpkin and won't have any left over. A double recipe makes 3 dozen muffins or more, depending on your own pans. These freeze well, but are also great to share with neighbors, teachers and friends. 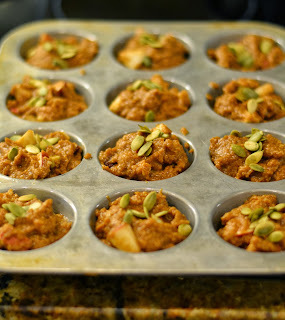 Preheat oven to 400 degrees F. Spray 2- 12 count muffin tins or use paper liners. Cut up apples. see how stiff the batter is? Spoon into greased muffin cups. I used a regular tablespoon, the kind you eat soup with. I heaped up the batter. It filled the muffin cup nicely. Top each muffin with a few raw Pepitas. Bake @ 400 degrees for 20- 25 min. for regular sized muffins. Makes between 18 and 24 muffins, depending on size of your muffin tin. Whip them up the night before to hand to your departing family as they rush out the door in the morning. So, get out that mixing bowl and get your bake on... It's pumpkin time! Happy Fall, y'all!